Is This Your Sign? It Is the Kiss Of Death To Your Business And Patients. I do apologise if this sign is in your Practice window but I would hate to think someone has not let you know that it is a really bad message to send to your patients, your business and people who would have been your patients. 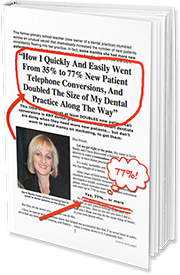 We often say or do things in our Dental Practice that patients see and hear differently. I took a photo of this sign as I walked past it the other day. I thought at first I was seeing things. Surely in this day and age this cannot be happening. On one hand the sign said the Dental Office was open and it read, “come in” but the door was locked. Then on the other hand there was the clock that showed 2.00pm and the sign read “Will Return”. Well, either you are open or closed. 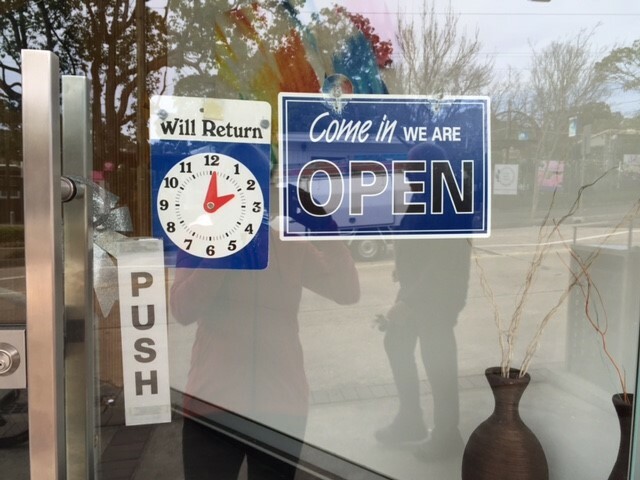 The sign letting people know when they would be back clearly means that there is no one inside so we are really closed at the moment. A locked door spells closed to me. I can’t get in and there is no one inside answering calls. Unless they were all hiding inside (even worse). Now just to clear up a few things, statistically, the time most people will call a Dental Office is in their lunch break usually between the hours of 12:00pm to 2:00pm. They next call after work hours. These are times that work out to be the most convenient for most people. I imagine if the door is locked and this sign is in the window it means there is no one answering calls and making appointments. This just does not make sense. Lunchtime is one of the most important and productive times to be available to answer calls, convert calls and make appointments. If you want to stay in business and show respect to the patients you are helping, be available 24/7 or as much as possible. Working hours is just a given. This sign is really the kiss of death. I even thought maybe the owner of the practice has no idea this sign is going up. Then I thought about the solutions to the problem they may be facing that has lead them to believe this sign is ok.
Everyone at work does need a lunch break. Stagger lunches so there is always someone to greet a potential patient walking in off the street and also to be there to answer the phone. Hire another person if there is only one person. You can’t run a practice with one dentists and a DA/Receptionist doing two jobs. Always, always have a person on the Front Desk answering calls. Never have a message bank to answer calls. Work out a way to answer all calls. So in a nutshell this sign should never go back up ever. The sign is actually telling you to make changes in your front office. The Practice down the road must be loving all the extra business and how busy their phones are at lunchtime!